I hope y’all are having a great April so far. It really amazes me how we’re already a quarter into the year. Like what, how did that happen. But it’s good thing right? It typically means there’s lots going on and wheels are turning or something. The month of March was an exciting, busy, and a nerve wrecking month. Not only did I get to travel for Tripaly and got to curate their Instagram account while accomplishing my goal of visiting San Francisco. South By South West was just around the corner as we landed back in Austin, and in usual SXSW manner a few opportunities came up within short notice. This SXSW topped last years in so many ways but also came in with new challenges. I was approached by the homie Rico De Leon from the Infinite Agency to take part in a new Influencer campaign for Bud Light. Up to this point I had been part of their social media campaigns by creating content shared on my account, but this was larger and incorporated InstaStories. As Instagram changes and evolves they added InstaStories not too long ago. Incorporating quick video clips, Boomerangs, and location specific filters. Similar to the way Spapchat was doing things but conveniently in Instagram. With this new development I was curious to see how this addition to the platform would change the way users interact with the app and how content is delivered by both the average users, influencers, and brands. Bringing me back to the assignment for Bud Light. I was paired with my best bud Mario Villanueva and were tasked with creating content for Bud Lights InstaStories. The content aimed to deliver a genuine SXSW experience captured through the eyes of local photographers, incorporating events sponsored by Bud Light. 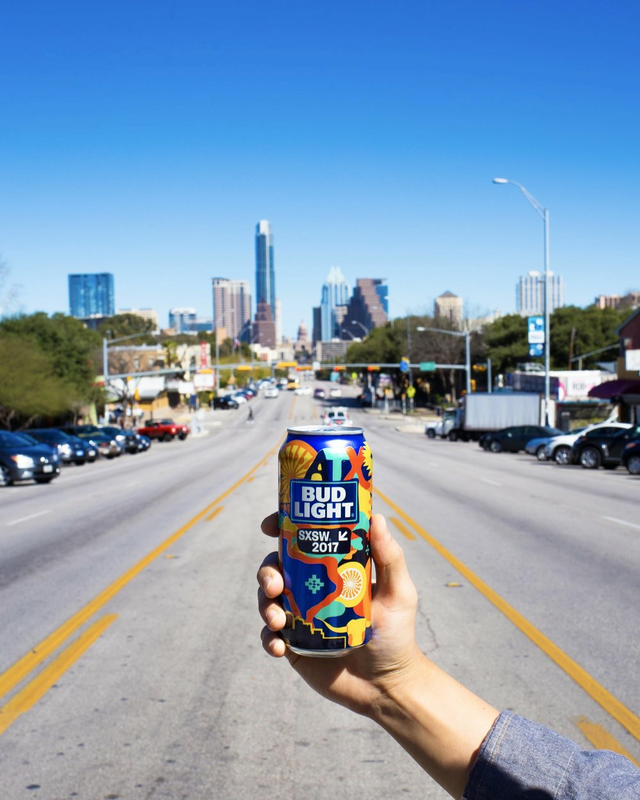 Throughout the day of our takeover we had the opportunity to visit several sights and enjoyed the chill atmosphere SXSW had to offer all while taking photos, boomerangs, shooting short clips, and hanging out with the Bud Light team. This was a big opportunity for me, putting Mario and I at the forefront of a large companies Instagram account. We were breaking some ground being the first to take on this challenge. The day began with a bit of nervousness but as the day passed as with any project you start to get a better grasp for the assignment and you get more comfortable. We ended up making some dope work both Mario and I were proud of and that the client liked. Wrapping up my first InstaStories assignment. During this same time one of my Insta peeps from Las Vegas was in town. Jovan Sotelo also know as @jovy.y on Insta, was visiting Austin for his birthday. I’ve been following Jovan for a long time at this point, so getting to connect with him in person was super sick. It's funny how you follow people on Instagram and build narratives based on what they share, but that's just an assumption. You never really know what to expect when you meet people in real person. Jovan, was quite the guy. I’ve seen his progression as an artist for the past few years and I'm a big fan of his work. We got to talk shop and learned more about his creative processes, and what's been fueling his most recent work. But what really captivated me was his enthusiasm and appreciation of life. He’s got to be one of the most self loving, encouraging, and positive people I have met and boy does he have a funny side. He had us cracking up and we really enjoyed his presence. Now we have to plan a trip to Vegas to visit him and explore his city. I strongly encourage y’all to check his work out and show some love. Its not often that you meet good people that genuinely wants you to succeed and supports you all the way. Much love to that guy! My last adventure during SXSW took place at Rainy Street and was for a new show called Search Party by TBS. The show captures a group of twenty-something year olds that live in New York City. The group of friends end up hearing about the disappearance of a person they all knew at one point, leading them through a series of adventures in search of this missing person. The show is pretty relatable since they're young millennials, cool and hip doing cool and hip things in NYC so that was attractive. During the time of the event for SXSW they had all the episodes available online so I did a little binge watching haha. The event for this was pretty rad, titled In Search Of Pop-Up Shop. It incorporated several local vendors, areas for viewing the show, and of course drinks and light bites were available along with a live Q&A with the cast. How cool is that! I was tasked with attending the event and capturing imagery that would be pushed on my Instagram and I had to create more InstaStories. This was turning out to be a big week for InstaStories but it was a pretty rad spot, so making content from this event was not bad at all and the agency Vayner Media that I was working with was a real pleasure to work with too. I also ran into the talented Ashleigh Amoroso another great photographer from Austin who was also highlighted by Culture Trip as part of the 10 Austin-Based Photographers to Watch Out For earlier this year so be sure to check her out. All in all this SXSW was decent and proved to be a another learning opportunity for me in many ways. I hope y'all enjoyed the imagery and as always thanks for stopping by and supporting! If y'all have any questions or feed back hit me up, or know of anyone who could benefit form my services please send them my way! I’d also like to get out there and shoot more for fun. So if any of y’all want to get some coffee, explore the city , and shoot some pics please reach out!